Slowly, I am working my way through these tutorials about Painting with Your Rotary Cutter. First up was Ruler Made Stripes. Today is about Mat Made Stripes. Mat Made Stripes are about taking a baby step away from your ruler. We will be using the lines on the cutting mat to help us cut strips of fabric that are approximately the size you want them to be. First, you pick your palette. If you want to know how I select a palette, you can by reading this blog post. 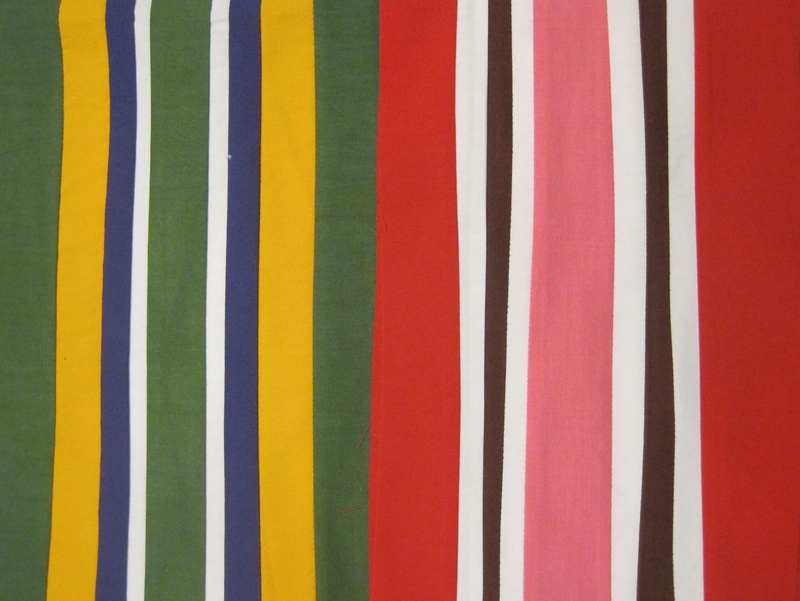 Next, design your stripe by mapping out the color order and width of each color. Iron your fabric so that it can be easily cut selvedge to selvedge. When I make Mat Made Stripes, I leave my fabric folded in half. 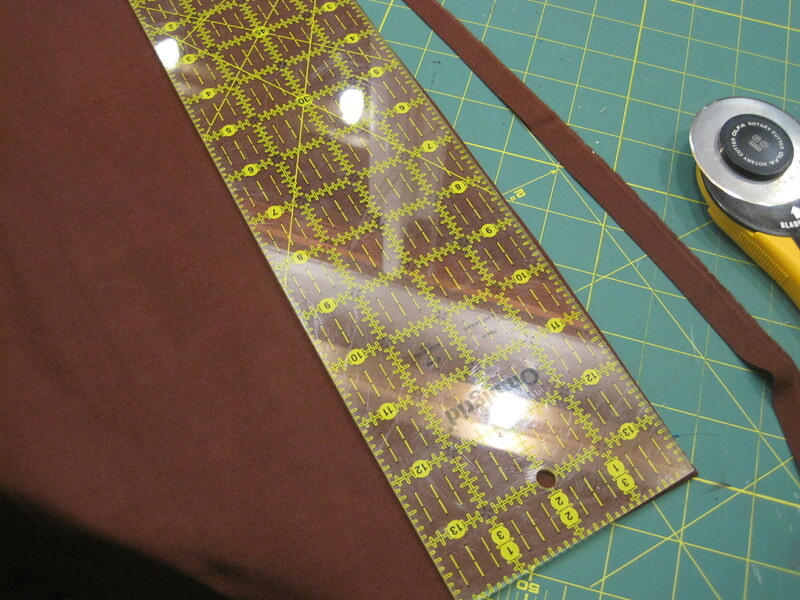 I take my ironed fabric to my cutting mat and using one of the diagonal lines on my mat, I line my fabric up. I smooth out the edge by cutting a nice clean line without using my ruler. 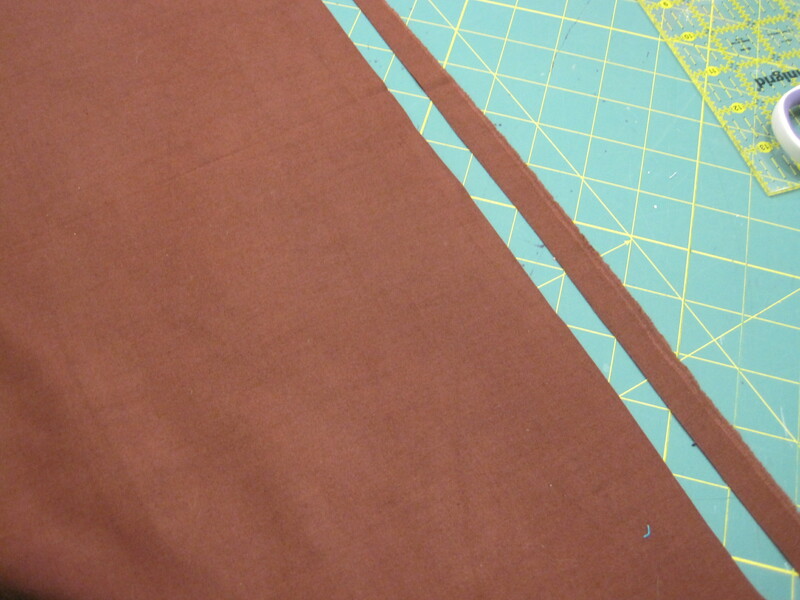 Next, I move the fabric beyond the diagonal line approximately the width that I want my final strip of fabric to be. If I am feeling anxious about this cut, I can check it with my ruler. I then remove the ruler and make my cut basically following the diagonal line on the mat. Here we see that I have made what I call a SLOPPY CUT. Whenever I do this, I acknowledge it to myself. “That’s a Sloppy Cut, Maria.” I feel it is very important to tell ourselves when we are doing shoddy work. Claim it and fix it. 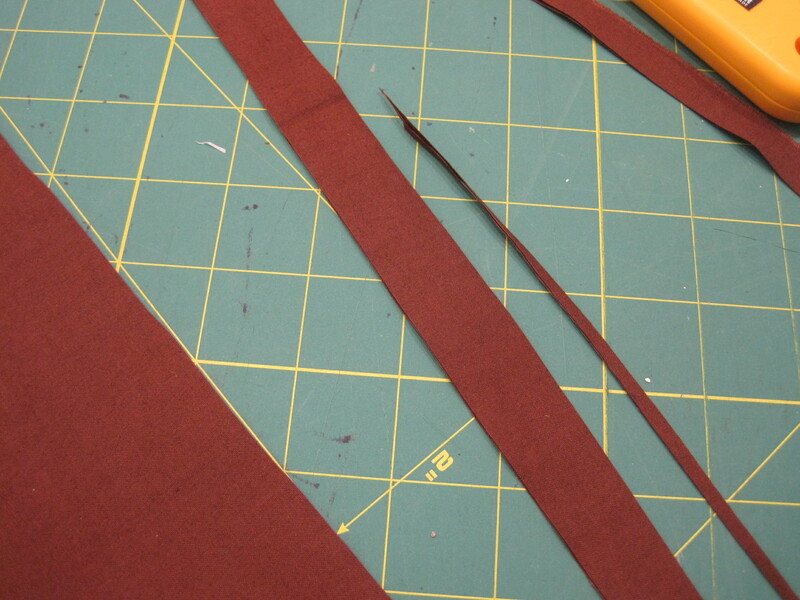 I then go back in with my rotary cutter and attempt to smooth out the line. This is much better. 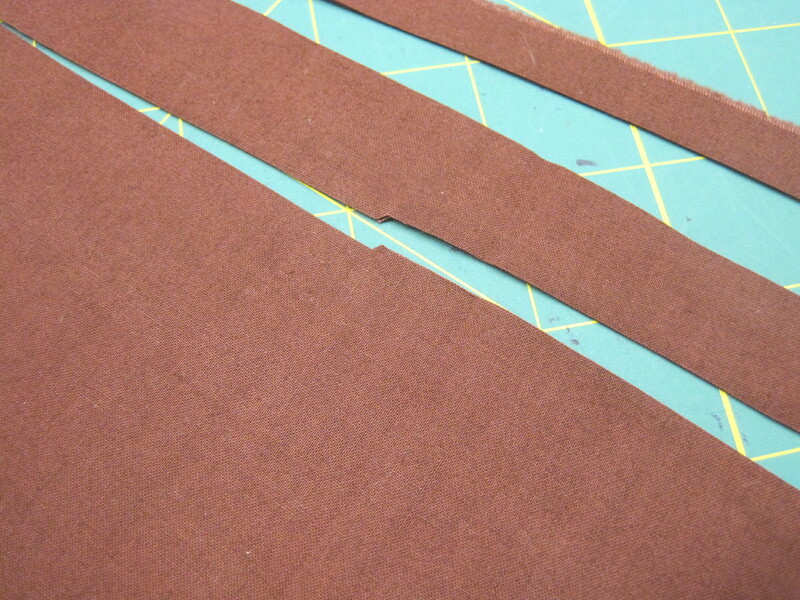 Repeat this process until you have cut all of your strips of fabric. 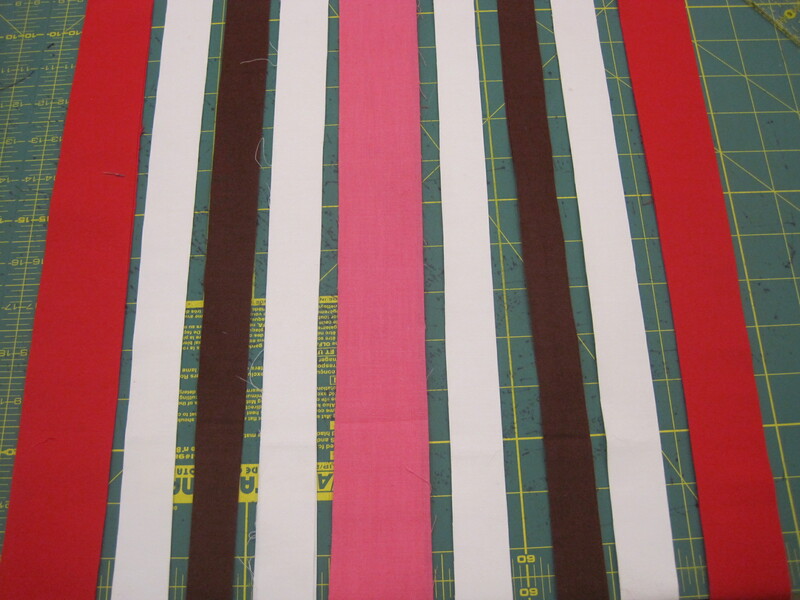 Here are my strips ready to be stitched into a stripe. I normally pair every strip up with a nearby partner and stitch, then iron, then trim, then pair again, and stitch until I have completed my stripe. 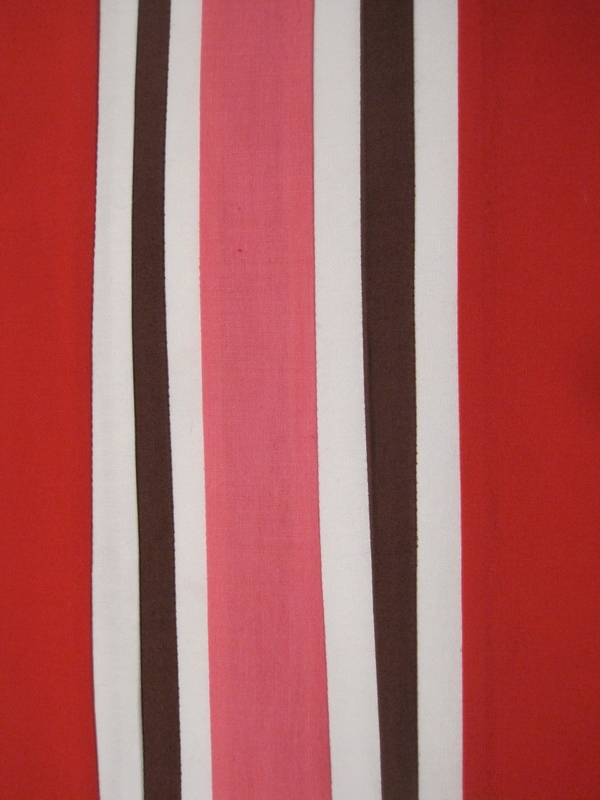 But for the tutorial, I decided to work my way across the stripe adding one color at a time. I first stitch red to white. 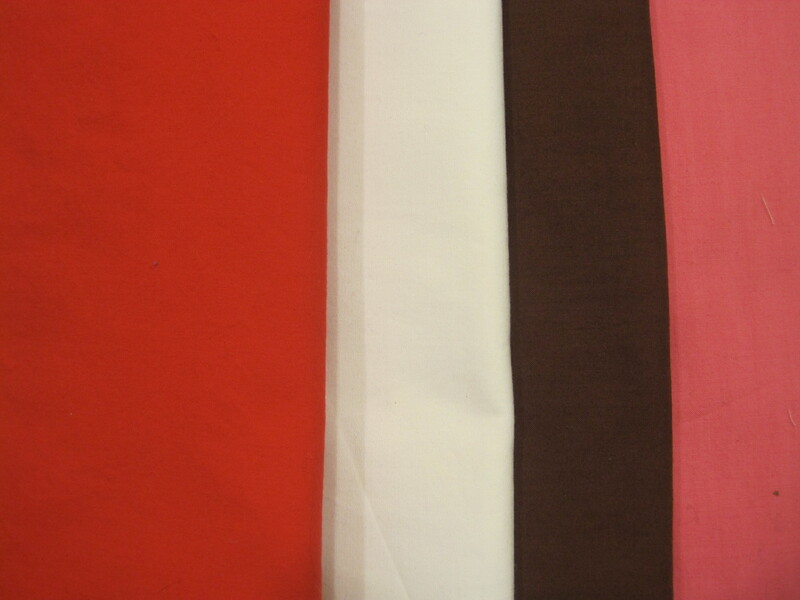 The edges of these fabrics are not straight because we did not use a ruler to cut them. Do not try to fix this. 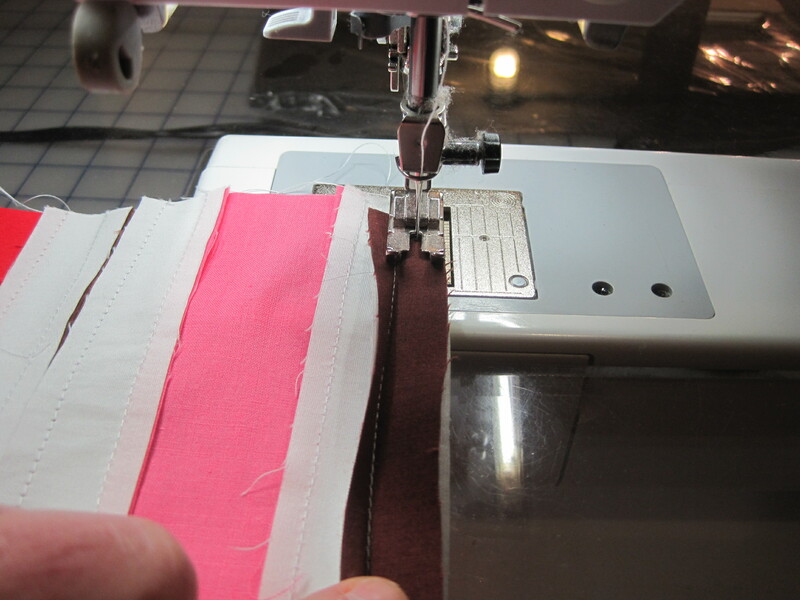 Instead you want to accentuate the curves by pairing the edges as you stitch. That is what I am doing in this photo. My left hand works to line the top fabric up with the bottom fabric while my right hand works to line the bottom fabric up with the top. Once I have ironed this seam, I go back to my cutting mat. 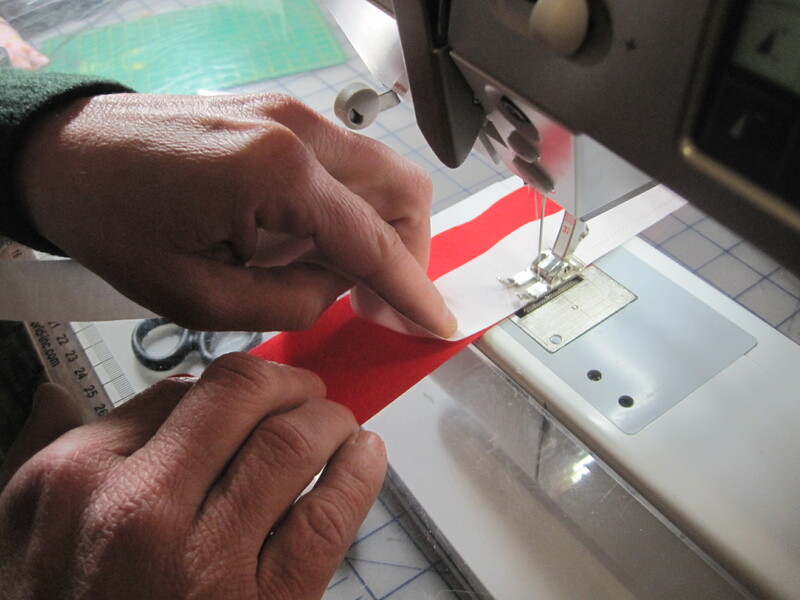 When I am making tiny stripes, I always cut them a little thick as it is very easy to go back and cut them a little thinner. That is what I am doing here. 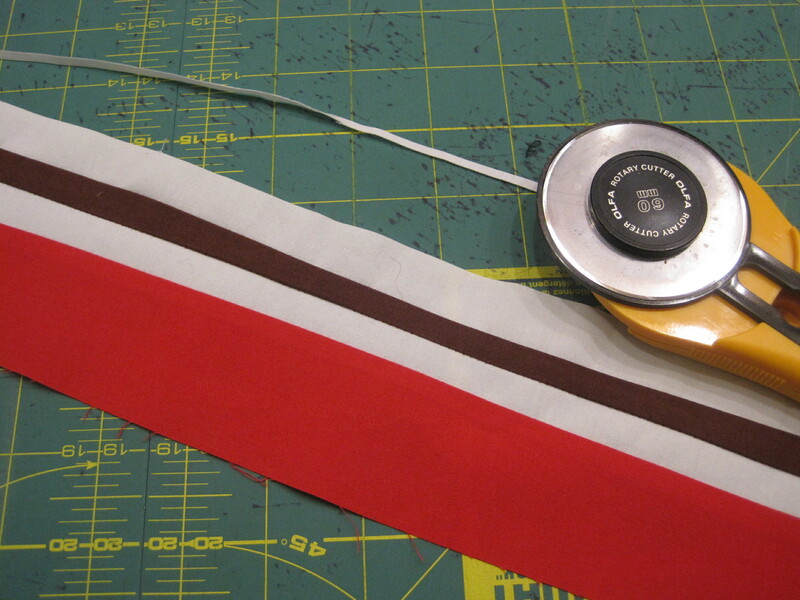 I continue to add strips of fabric to my stripe trimming the strips as needed. Usually I stitch with the larger piece of fabric on the bottom, but if the strip of fabric is super tiny, I sometimes piece this way to make sure I do not stitch into my ironed seam allowance. Now that is a lovely stripe. Here it is next to the Ruler Made Stripe. There is a distinct difference between the two. I prefer the Mat Made Stripe–it just seems to have more character. Those of you who have been following my posts about Object Runway know that I have been hunting for Carhartts. My dear friend Beth (Thank you Beth!) even put the call out on Facebook. It turns out only dead Alaskans part with their Carhartts. Fortunately for me, the Thrift Store Fairies heard my plea, and I found these extra EXTRA large Carhartts earlier this week. Happy Friday Folks! Check out what other stitchers have been doing by stopping by Nina-Marie’s. 19 Dec	This entry was published on December 19, 2013 at 8:47 PM. It’s filed under My Process-Quilts and tagged Making Solids into Prints, Mat Made Stripes. Bookmark the permalink. Follow any comments here with the RSS feed for this post. I like your mat made stripes and their unique personality. By the way, dat some big pants! 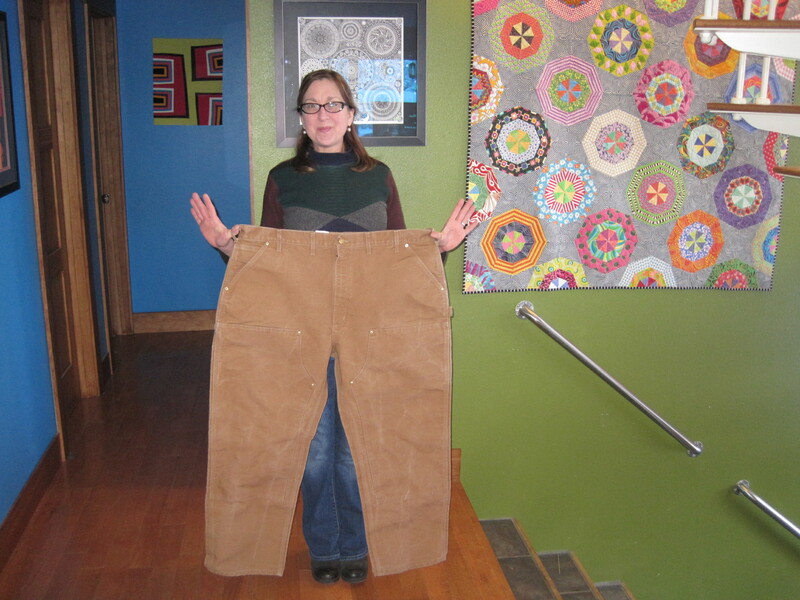 I was totally psyched to find those big pants! Lots of fabric in those bloomers! I know! It’s like a big Christmas present. That takes a type of precision work and patience that I don’t have anymore. Your stripes look great and do have a personality. Thanks Regina. I know what you mean. If I have to do everything with a ruler and make it all matchy-matchy I get very bored.